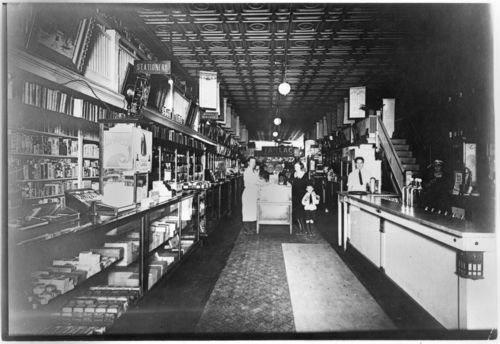 These photographs show the interiors of two unidentified drugstores in Great Bend, Kansas. One picture shows stationery items for sale, a soda fountain, and some employees and customers. The other picture shows a soda fountain and three men, with items for sale in display cases. The latter photo has been identified as Lefty Holmes' Drug Store in the 1400 block of Main Street, Great Bend, courtesy of the Barton County Historical Society. Holding Institution: M. V. Fryberger, 1968.